At the same time, we measured the voltage generated in our BVP cell, using the untransformed and transformed Synechocystis. In this experiment we investigated the effect of differing amounts of time exposed to light in solar cell conversion of light into electricity. We measured the voltage across 4 different solar cells. Two were kept in light overnight and the other two were kept in darkness. After being kept in their relevant conditions throughout the night, the solar cells were then kept in the dark for 10 minutes before we put them into fuel cells. Then, the two solar cells that had been exposed to light (Light 1 & 2) and one of the solar cells that was kept in darkness (Dark 1) were exposed to light (lamps set up either side of the cells) whilst the voltage (mV at Lux: 790) was being recorded. This was done using a voltmeter with connecting wires on the electrodes of the fuel cells. We recorded the voltage at 10-second intervals for just over ten minutes (620 seconds). Therefore, we were able to measure the potential difference against the amount of time following the solar cells’ exposure to light. Figure 1.Results of our initial BVP experiments. 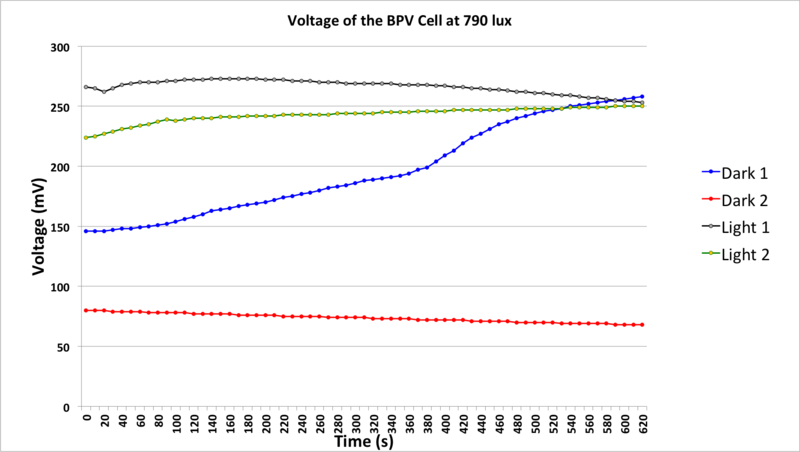 The solar cell we used as a control showed a decrease in voltage over the 620 seconds starting at 80mV and finishing at 68mV. Light 1 (starting at 266 mV) showed a very slight increase in voltage before decreasing by a small amount to 253mV. Light 2 only increased in voltage from 224 mV to 250 mV. Dark 1 showed the biggest increase in voltage (146mV to 258mV).